The FogBugz team is committed to unlocking more of FogBugz’s power as a planning tool. 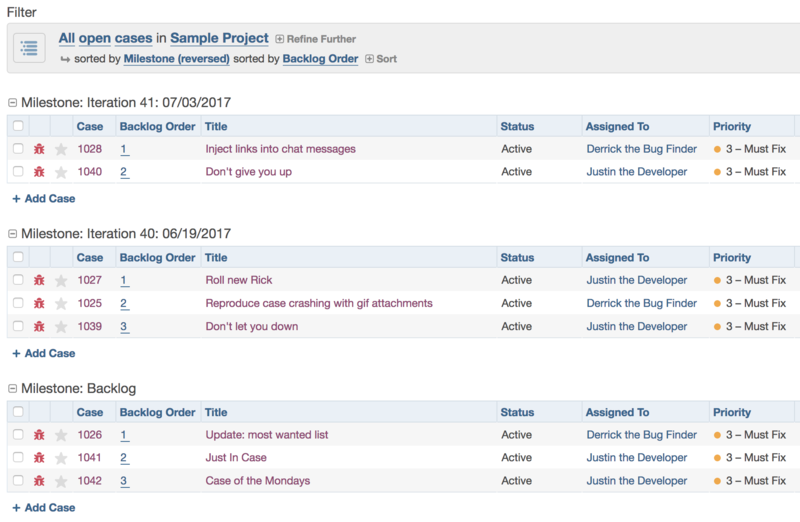 To make FogBugz easier to use for Agile workflows we’re adding a new Iteration Planner interface. Iteration Planner handles managing your project/product backlog (which was previously managed via the Project Backlog plugin) and adds tools for planning your iterations quickly and effectively. The idea is that you’ll be able to better organize your scope of work into cases that are collected in milestones that can map to sprints or other phases in the project life cycle. If you are using FogBugz On Site or FogBugz On Demand with the Agile Module, you can start using Iteration Planner in one click. Click the Planner button in the header. 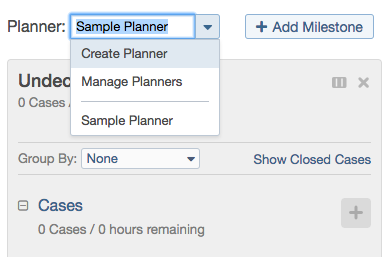 New accounts—or those who’ve never used the Planner before—will be taken to the default “Sample Planner”, containing the first project and global Undecided milestone. In the window that appears, give it a name, and add whichever projects you’d like to include. Each planner can include one or more projects. Here is an example with two projects which one team works on simultaneously. It includes global milestones for “backlog” and “current sprint” and some per-project milestones for the two products they work on. It’s important to note that to avoid confusion with the relative ordering of cases, FogBugz will only show a given case on one planner. This means that it only allows you to put a per-project milestone on one planner. If a milestone is global, it can be added to several planners, as long as those planners do not have any projects in common. If you try to add a milestone to a planner and see it grayed out in the dropdown, a message next to the name will tell you where it is already in use (hover over it with your mouse if the text is too wide to see). You can do so with a read-only filter column. Save a filter and you can add it to multiple planners, letting you reference cases for context or drag them out into milestones to update your plan. Create a milestone called “Backlog”. This milestone is going to be your new placeholder for work you might do or have to do, but not work you plan on doing in the current sprint or iteration. We recommend setting it as a Backlog Milestone. Internally, all milestones track the integer ordering of cases. Setting the “backlog” flag shows the values in the planner for easier reordering. If you’re using the Project Backlog plugin, we can migrate your existing Project Backlog orders to the Iteration Planner. Please write at our support portal support.fogbugz.com, Subject: Migrate Project Backlog to Iteration Planner. Let us know if you have a window in which you’d like to see your data migrated, or if you’d prefer it done ASAP. We’ll get back to you by the next business day to confirm the window or to let you know it’s all done! A sprint is also referred to as a milestone in FogBugz. Follow these directions to create and populate your next sprint. This will help your team know what’s on deck, so they can start working on your next big feature. Click and drag a case within a column (the sprint) and move it up or down to indicate the order of the case relative to other cases. If your milestone is a Backlog Milestone, you can skip the dragging and just click the indicated order to enter whatever value you’d prefer. A progress bar visualizing the hours logged against the case, or “Needs Estimate” if the case lacks an estimate of time. Hover the mouse over the bar to see the time estimated and logged. If a case is closed, “Closed” is shown in place of times. Priority of the case indicated by number and color. Lower the number, the higher the priority. The darker the color, the higher the priority. “# Cases” – This tab summarizes the number of cases in this milestone or sprint. Click into it to see the number of cases with estimates per priority. “# Hours” – This tab summarizes the number of estimated hours in this milestone or sprint. Click into it to see the total hours estimated by the person. “# cases w/o estimate” – At each time, this is the number of cases for this milestone or sprint that do not have any estimated hours. As with the case list, the Iteration Planner shows the sum of hours (estimated and logged) for any case which has sub-cases under it. Backlog Milestones with no ordering will also show the current position in the milestone for each case. This is optional but recommended. Next to the project, you can choose between showing estimates in hours or estimates in story points depending on your workflow. Estimates can be entered directly in the Iteration Planner or through the full case edit view. When using hours, a progress bar will update as time is logged against the case. Good estimates are an important piece to determine whether your sprint has the right amount of work planned. If a story point value is entered and there is no time estimate, an estimate is not created. The Iteration Planner provides a shared view of your data. Your teammates can access this view by selecting the same item under the Planner menu. The Iteration Planner is a great place to populate your milestones and determine task order. For day-to-day operations, the filter view gives you more context about all the work available in FogBugz. These two views can be bridged with the Backlog Order column. Are you finding the tool effective at organizing your backlog? Is the Iteration Planner a tool that you can use to plan your sprints?